WILLIAM THORNE was said to be 76 when he died in Filleigh in 1815, giving him a birth date around 1740. 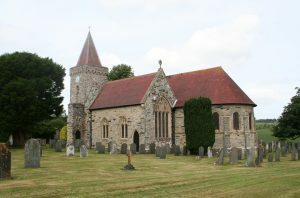 The most promising baptism is in the neighbouring village of Chittlehampton. In medieval times this was a major pilgrimage site, with the shrine of the local saint Urith, who was said to have been martyred there. Her church, with her name Latinised as St Hieritha, is considered to have the finest tower in Devon, evidence of the former wealth of the village. On 9 April 1741, William, son of Henry and Dorothy Thorne, was baptised there. His mother was Dorothy Davy. He was the eldest son, and third child, in a family of eight. There is no evidence of his father’s occupation. William himself became a husbandman, and this may have been his father’s work too. William may have inherited a small farm, or the lease of one, from Henry. His father died in 1763, when William was a young man of 22. At some point William moved to the parish of Filleigh, just north of Chittlehampton, and farmed there as a husbandman for the rest of his life. MARGARET FERRIER was from an older Filleigh family. She was born there in 1747, the daughter of John Ferrier and Mary Dunn. She was baptised on 12 Feb.
She had a sister who died in infancy, leaving her the only known daughter in a family of five, but there is a break in the Filleigh baptismal register from 1738-42, so there may have been older siblings. She was known to her family as friends as Peggy, a common abbreviation for Margaret. She evidently came from an affluent farming family. At the 1780 Land Tax her brother Richard was the owner and occupier of five properties in the parish. Her mother died when she was 16, and her father probably before this. William and Margaret married in 1766, in the reign of George III. Banns of the Marriage between Wm Thorn & Margaret Ferrier both of this parish, were published March 16, 23, & 30 1766. The said Wm Thorn of this parish and the said Margaret Ferrier of this parish were married in this church by banns this first Day of April in the Year of One Thousand Seven Hundred and sixty six by me. Wm Markers. Rector. Both the couple signed their names, in a rounded, but not very fluent, hand. Margaret is uncertain how to spell hers. The witness John Ferrer is probably her brother. It seems likely that her father had already died. The church of St Paul in Filleigh dates from 1732. Lord Clinton wished to replace the manor house with the Palladian mansion of Castle Hill. To improve the view, he demolished the village and its medieval church and rebuilt them half a mile away. The couple had seven children, six girls and a boy, baptised here. All their children lived to be adults. Their mother Margaret died in 1792, when the youngest, Agnes, was only eight. 1792 Margaret Thorn. Oct 15 92. She had survived seven childbirths, but was only 45 when she died. Agnes remained single, keeping house for her father while her older sisters married. The only son, William junior, with his young family moved a short distance to Kings Nympton, while daughter Catherine went to Mariansleigh. She married the husbandman John Cook and brought up her family there. William senior lived on until 1815, the year of the Battle of Waterloo. He was 74 when he died, though the burial record makes him two years older. 1815 William Thorne . Filleigh. May the 28. 76 years. In January of that year he had made a will. His executors were William and Agnes. He bequeathed small sums of money to his children, ranging from £15 for Agnes to £4 for Margaret, and to two of his grandsons, Henry and John Roberts, to be paid when they were 21. These boys may be the children of Mary, who is not included in the list, though ‘my daughter Mary Reed’ is named further on. The residue of the estate was to be invested in a trust, with his seven children and the Roberts grandchildren each benefiting from an eighth share. When the will was proved, the value of his effects was £300. His only son William had risen from his father’s status of husbandman to that of a yeoman, with a more substantial farm. This is the last Will and Testament of me William Thorne of Filleigh in the County of Devon Husbandman I give and bequeath unto my Son William Thorne the sum of nine pounds and fifteen shillings – unto my daughter Sarah Crossman the sum of thirteen pounds – unto my daughter Margaret Seworthy the sum of four pounds – unto my daughter Catherine Cook the sum of six pounds three shillings and six pence – unto my Daughter Elizabeth Lane the sum of ten pounds and unto my daughter Agnes Thorne the sum of fifteen pounds all of lawful money of Great Britain And it is my Will that the said Legatees shall be paid at the end of the year next after my decease. Also I give and bequeath unto my Grand Children Henry Roberts and John Roberts the sum of three pounds and six shillings apiece of lawful money as aforesaid to be paid them respectively as and when they shall attain their several ages of twenty one years with lawful interest for the same in the mean time And in case either of my said Grand Children shall happen to die under the age of twenty one years and unmarried then I give and bequeath the legacy of him so dying unto the other or Survivor of them my said Grand Children But in case both of them my said Grand Children shall happen to die under the age of twenty one years and unmarried then I give and bequeath their said legacies unto such of my Children as shall be living at the time of my death equally to be divided amongst them share and share alike Also I give and bequeath unto my said Son William Thorne and my said Daughter Agnes Thorne all the rest residue and remainder of my goods chattels and personal estate whatsoever and wheresoever subject nevertheless to and charged with the payment of all my just debts the said legacies and the expenses of proving this my Will and of my funeral To hold the same so subject and charged as aforesaid unto my said son and daughter William Thorne and Agnes Thorne their executors administrators and assigns upon the trusts following (that is to say) As to one full eighth part thereof Upon Trust for my daughter Mary Reed her executors administrators and assigns As to one other full eighth part thereof Upon Trust for my said Son William Thorne his executors administrators and assigns. As to one other full eighth part thereof Upon Trust for my said daughter Mary Crossman her executors administrators and assigns As to one other full eighth part thereof to my said daughter Margaret Seworthy her executors administrators and assigns As to one other full eighth part thereof to my said daughter Catherine Cook her executors administrators and assigns As to one other full eighth part thereof to my said daughter Elizabeth Lane her executors administrators and assigns As to one other full eighth part thereof to my said daughter Agnes Thorne her executors administrators and assigns And as to the remaining eighth part of the said residue of my personal estate Upon Trust for my said Grand Children Henry Roberts and John Roberts as tenants in Common to be vested interests in them my said Grand Children upon their resepectively attaining the age of twenty one years or upon their respective days of marriage which ever shall first happen with limitations in the nature of Cross remainders as to the said eighth part of my said Grand Children between them the said Henry Roberts and John Roberts in case either of them shall die under the age of twenty one years and unmarried And in case both of these my said Grand Children shall happen to die under the age of twenty one years and unmarried then I direct that my said Son and daughter William Thorne and Agnes Thorne their executors administrators and assigns shall stand possessed of the said eighth part of the residue of my personal estate hereby intended for my said Grand Children Upon Trust for such of my Children as shall be living at the time of my death as tenants in Common and their respective executors administrators and assigns And it is my Will that my said trustees or either of them shall not be liable to answer or make good any loss or losses that shall or may happen to the aforesaid Trust estate in the execution of the Trusts contained in this my Will unless the same shall happen by or through their or either of their wilful neglect or default Nor shall one of my said trustees be answerable or accountable for the other of them or for the acts deeds receipts or disbursements of the other of them but each of them shall be answerable for his or her own separate acts deeds receipts and disbursements And I do direct that my said Trustees shall and may pay and reimburse themselves himself and herself out of the aforesaid Trust estate all reasonable and necessary costs charges and expenses whatsoever that they or either of them shall or may pay be put unto or sustain in or about the execution of this my Will or the trusts hereby in them reposed And I do hereby nominate constitute and appoint my said Son William Thorne and my said Daughter Agnes Thorne Executor and Executrix in Trust of this my last Will and Testament and hereby revoke and make void all and every other Will and Wills by me at any time heretofore made In Witness whereof I the said William Thorne the Testator have to the first sheet of this my Will (the whole whereof is contained in two sheets of paper) subscribed my name and to this second and last sheet subscribed and set my hand and seal this thirteenth day of January in the year of our Lord one thousand eight hundred and fifteen. Signed sealed published and declared by the above named William Thorne the Testator as said for his last Will and Testament in the presence of us who at his request in his presence and in that of each other have subscribed our names as Witnesses thereto.